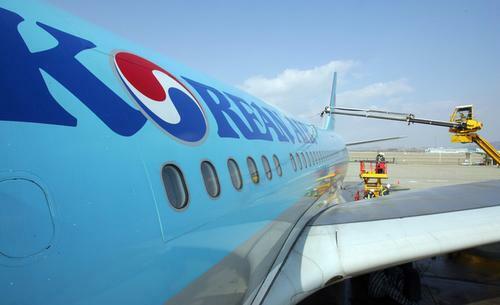 Customs authorities said Monday officials have raided a supplier of Korean Air Lines Co. and seized dozens of boxes of goods believed to have been smuggled for members of the family of the national flag carrier's chairman. The Korea Customs Service has been looking into allegations that Korean Air Chairman Cho Yang-ho's family smuggled certain goods without paying due taxes while reportedly disguising them as corporate assets. A 2.5-ton truck loaded with confiscated goods is heading to a warehouse of the Korea Customs Service in the western port city of Incheon, said Ryoo Ha-sun, an official at the spokesman's office of the Korea Customs Service. The goods were taken from a supplier of goods used in airplanes. "The seized goods are suspected to have been smuggled and we need to check them further," Ryoo said by phone from the central city of Daejeon. Ryoo did not identify the supplier and he did not elaborate on the seized goods. The Cho family has been under a series of investigations after the chairman's youngest daughter, Cho Hyun-min, a former executive of Korean Air, was accused of allegedly assaulting ad agency officials. Hyun-min is the younger sister of Cho Hyun-ah, who gained global notoriety for the "nut rage" incident in 2014. She forced a plane back to the boarding gate at New York's John F. Kennedy International Airport because she was upset with the way her nuts were served -- in an unopened bag instead of on a plate. Monday's raid by the KCS is the fifth conducted on the national flag carrier. KCS officials said Monday's raid was carried out based on an analysis of telecommunications records between Korean Air and the supplier.